Modern Hero | Ukulele Kids Club Inc.
Congrats to Stephanie Epstein at Holtz Children’s Hospital. You remain our Modern Hero. 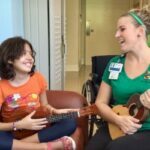 Meet Stephanie, our everyday hero who helps children as they heal through her innovative use of music and song.